It was a cold October afternoon, rain slicking the city streets, when a car crashed into the one carrying sommelier Yannick Benjamin. The wheels of Benjamin’s vehicle screeched on the pavement as it came to a full and sudden stop. Stunned, he tried to catch his breath, as confusion and shock began to seep into his bloodstream. With each inhale, pain like the pull of a magnet twinged somewhere in his ribs. Smoke billowed from the hood, shifting him into fight-or-flight mode; suddenly exhausted, he managed to get out the car and crawl towards the highway in search of help. Each drag of his body on the road rolled his pants down to his ankles; he was covered in dirt, grass, and rain, but couldn’t feel a thing. Later, he’d learn that the crash had completely severed his spine at the T6 vertebrae—located between the middle of the waistline and chest—permanently paralyzing his legs. Working in hospitality was always in the cards for Benjamin. Born in New York to a family of French restaurateurs, he cut his teeth in the industry at 15, as a porter at Bryant Park Grill. He took roles at some of NYC’s top establishments—Le Cirque, Jean-Georges, Atlas, and finally, the Atelier at the Ritz-Carlton. He was unstoppable. Turns out, even severed spines can’t stop the unstoppable. These days, when Benjamin is on the floor of a restaurant, he forgets he’s in a wheelchair. When he’s there, telling stories about a bottle he’s pouring—its history, its people, the land—his only objective is to gift people a cerebral moment, stimulated by a glass of wine. 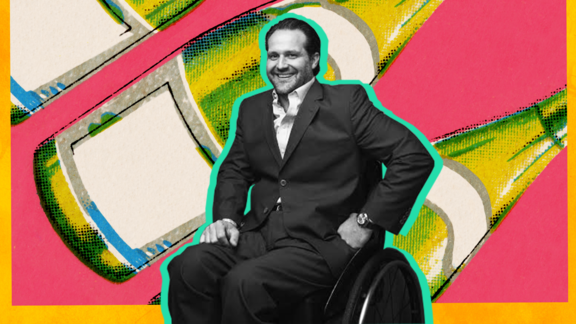 As the head sommelier at New York City’s University Club, Benjamin advocates for the disabled community in everyday interactions, as well as through his non-profit Wheeling Forward. We spoke with him recently about misconceptions around the disabled hospitality community—and how our industry can make true inclusivity a reality. Shanika Hillocks: You come from beginnings ingrained in the wine and food, but what moment brought you to the hospitality space? Yannick Benjamin: Simply put, the concept of servitude. I was always heavily influenced by the Christian brothers that taught me in elementary school, and deeply admired how they were intentional in the practice of two things: kindness and the ability to serve. To me, this is the highest standard of hospitality. The moment that gave me full confirmation was a visit to Château Giscours in Bordeaux, where my mother is from. I can recall the smell of cellar, the generosity of the people working at the winery, and I knew, even at the age of 13, that I had to stay connected to this world. What were the challenges and triumphs you experienced within the first few years [after the accident]? At the time of the accident, I had built quite an impressive resume. The biggest challenge for me was overcoming the thought of never working in a restaurant again. My fear turned into anger; I had worked so hard to become a professional in the field, only to have it taken away from me. How could I still perform as a sommelier in a wheelchair? I’d Google “wheelchair sommelier” regularly, but found no one with whom I could connect. I realized I would have to do this alone. During rehab, I worked with the physical therapists to concept what that would look like and started small, carrying wine glasses and bottles on my lap while pushing my chair. My good fortune came about when Jean-Luc Le Du, who was the renowned sommelier at Daniel, decided to open a wine store in 2005. A good friend of mine referred me to him, but he had a full staff at the time. In a plight of desperation, I asked if I could work for him for free. He thought I was crazy, but the opportunity gave me the confidence and technical exposure I needed to acclimate. In conjunction, I competed in more than 20 major sommelier competitions with hopes that my skill would be recognized and I’d get a job, but more importantly, to occupy a space where someone like me wasn’t represented. Tell me about Wheeling Forward, how the organization came to be, and its connection to hospitality. I met my partner Alex Elegudin in rehab and we co-founded Wheeling Forward, a nonprofit driving progress in the disability community. Today, Wheeling Forward helps hundreds of New Yorkers get back to living active lives with the resources, community, and inspiration they need to make their dreams a reality. As a way to support Wheeling Forward, I created Wine on Wheels, one of New York City’s largest and most exciting wine events. Held annually, it brings together hundreds of esteemed sommeliers volunteering to pour over 180 wines from around the world for charity. Most of all, I like to consider Wheeling Forward a hospitality driven non-profit; I tell everyone who works with us that it’s important we take the word “no” out of our vocabulary, and that we learn how to be solutions-oriented while providing the best service. Wheeling Forward will also have a connection to my latest project, Contento Restaurant. It will feature sustainable farm-to-table cuisine by using both local and organic ingredients from East Harlem’s La Marqueta and the Hunts Point Produce Market in the Bronx. The team behind it has close ties within the disability community throughout NYC, and we plan to utilize our experiences and location to offer enriched programs that will enhance the quality of life for people living with disabilities. What are some misconceptions about people with disabilities that you’d like to address? The biggest misconception about people with physical disabilities is that they are limited on what they can offer, which couldn’t be further from the truth. Some of the most brilliant people I know have a disability and unique viewpoint that most able-bodied individuals don’t. I believe that hiring someone with a disability would give the workplace a huge vantage point and an incredible diversity. People with disabilities are not going anywhere and we’re a growing population, so integrating both worlds is a win for all. The more progressive we become, [the better] we set ourselves up for future generations. What are some actionable takeaways that the hospitality trade can do to support the members of the disabled community? I hope that more people in the industry—particularly those in leadership roles—will start thinking outside the box and consider things like mentoring people with disabilities. It starts with education, and taking the initiative themselves to understand that no two disabilities are the same. Could you imagine if Stephen Hawking was completely ignored? The world would have been deprived of this genius. I believe that our next Ferran Adria or Dominique Crenn [is] in the disability population, but we need to create more opportunities and give them the tools they need. Speaking of tools, what are some of the things you’ve observed in the hospitality space that could be improved for the disability population? From an infrastructure perspective, I would like to see menus in braille available on request for the blind. I believe that part of the bar should be lowered, so those [who] are in their wheelchair can comfortably roll up and enjoy a cocktail, glass of wine, or bite to eat. There is also a lack of bathrooms that are actually ADA compliant in many restaurants. I’d like to see the implementation of sensitivity training when dealing with people with disabilities. More importantly, I’d like to see more people with disabilities hired by major hospitality companies and that they are visible—not hidden in the back of house.